On Charles’ first trip to the Philippines, we went to Bohol which is located in the Central Visayas region and east of Cebu. We wanted to go to Cebu originally. But since we were only staying for three days, we chose Bohol. Bohol is considered the tenth largest island of the Philippines. Like any other islands in the Philippines, Bohol is famous for its beaches and resorts. Panglao Island which is located southwest of Bohol is known for its diving locations. You will also find here the second smallest (used to be the smallest) primate, Tarsier. 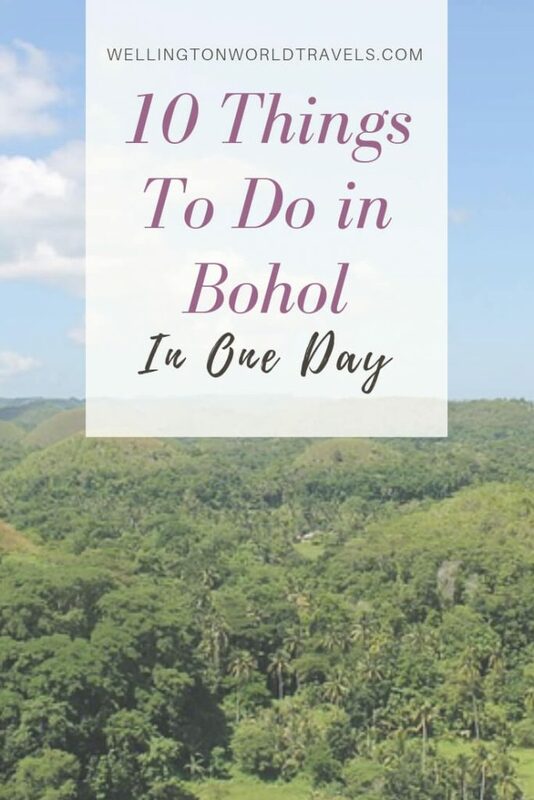 Whether you do it on your own or join group tours, here are the 10 things to do in Bohol in one day (aside from going to the beaches). Bohol is known for Chocolate Hills that turns brown like chocolate during the dry season hence the name. There are at least 1, 260 hills of 30 to 120 meters high spread over an area of more than 50 square kilometers. The garden inside the center is beautiful. But I think what made the visit interesting was the tour guide. He was very informative and fun. He took a lot of nice innovative photos for us with the butterflies. The tour will only take 30 minutes or less, so I think we got our money’s worth. It also has a small restaurant that sells cheap lunch and homemade ice-cream. The bamboo-woven 40-meter long Hanging Bridge is located in Sevilla, suspended across Loboc River. Since it has become a popular tourist attraction, they have set safety standards: maximum of 10 persons at a time, and only one way. Don’t worry! There is another bridge for return. On the other side of the bridge, they are selling souvenirs and local snacks. Oh! By the way, it creaks, bounces and sways with every step as you make your way across (eek!). They also call it a floating restaurant. The boat resembles a large floating house serving Asian and European cuisine in buffet style with a live band while enjoying the picturesque view. The food was delicious. But I may be biased since I am a Filipino. I heard other foreigners find the food just ok. The boat ride takes one and half hours. Towards the end of the trip, Filipino women and children dressed in traditional clothes will be singing and dancing. You are welcome to join, and of course, give tips. Some travelers said this is too touristy and overpriced. But PHP 450 is $9 which is cheap for a buffet plus cruise. Loboc Eco-Tourism Adventure Park is known for its zip line. It is not extreme, but it is an amazing one-minute experience. It is 520 meters long and 120 meters high. For those who are not fond of the zip line, they have a cable car available that can fit up to 5 adults. Tarsiers are the second smallest primate in the world, ranging from 10 to 15 centimeters in length, mainly found in the Philippines, Malaysia, and Indonesia! They are vulnerable to extinction. Thanks to the efforts of the Conservatory and government, they are well-taken care of! The Conservatory tour will only take less than 20 minutes since they don’t want to stress the tarsier out. They have an incredibly strong auditory sense so it is advised to refrain from making any noise. Also, avoid taking pictures with flash! It might destroy their eyes. Their large eyes help them to catch preys at night. Also known as The Immaculate Conception of the Virgin Mary Parish Church, Baclayon Church is the oldest Church settlement in Bohol. It was declared a National Cultural Treasure and a National Historical Landmark. Moreover, the Baclayon Church was formerly included for the UNESCO World Heritage Tentative List of the Philippines in 1993. However, due to its damages brought by a 7.2 magnitude earthquake in 2013, it was removed as a nominated site. The Philippines was colonized by the Spaniards for more than three centuries. The blood compact (or Sandugo) is considered as the first treaty of friendship between the Spaniards and Filipinos. This was performed by the Spanish explorer Miguel Lopez de Legazpi and Bohol chieftain Datu Sikatuna in 1565. Sandugo, meaning ‘one blood’, was done by cutting their left arm with a dagger and pouring the blood into a cup filled with wine, then drank it in honor of their friendship. I think this is probably the only cool place in Bohol without the use of an aircon! Actually, there really isn’t much of an attraction here. It is just a road lined with Mahogany trees. But the view is very beautiful and peaceful. The air is fresh and has a cool temperature. This road leads to the famous attraction, Chocolate Hills. These trees were planted in an effort to restore the forest damaged by kaingin (slashing and burning of trees). Don’t forget to buy a little keepsake or remembrance of your adventure in Bohol. Tagbilaran City Seaport (or Tagbilaran City Tourist Pier) serves passengers daily from Cebu on fast crafts, and regular ferries coming from Cagayan de Oro, Iligan, Dipolog, Dumaguete, Cebu, and Manila. Tagbilaran Airport (IATA Code: TAG) is located in Tagbilaran, the capital of Bohol. You can fly there directly from Manila via Cebu Pacific or Philippine Airlines. If you like privacy, more personal and noise-free (away from bars and beaches) stay, then Veraneante Resort is for you. 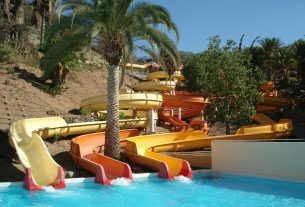 It is a family-owned resort with cottage-style rooms that add to its intimate and cozy atmosphere. Shuttle service to the airport and Alona Beach is provided at no additional charge. That’s 7 minutes drive to Alona Beach and approximately 20 minutes drive to Tagbilaran airport and Seaport. Want more posts on the Philippines? Or thinking of another destination? 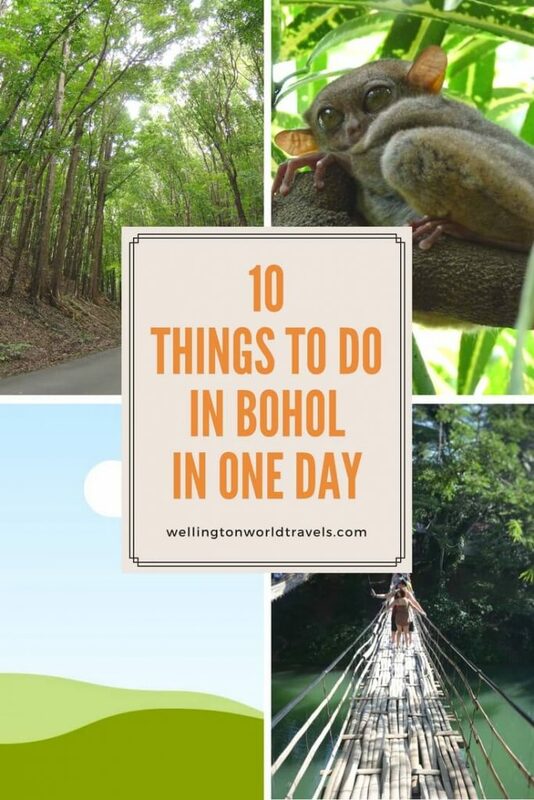 Have you been to Bohol? What other things did you do? Share with us your experience in the comments below! Love love Bohol. Our little family loves there. They have stunning beaches. Yes, we also had a great time in Bohol. And they certainly have stunning beaches!!! Absolutely! Thanks for reading the post! I would love to visit all ten of these tourist areas! I really like the view of the Chocolate mountains. The Philippines is on my travel bucketlist. Bohol is a great island, and the Philippines is an amazing country. I might be biased though ? It’s not as popular as Palawan, Boracay, and Manila. But it’s a great island. My cousin married someone from the Phillippines, but I’ve never been! It looks like an amazing place and seems as if there’s a lot to see and do! I think the conservatory would have been my favorite spot! Your photos are fantastic, by the way, and belong in a magazine spread! Thanks, Kristi. Appreciate the kind words. Very informative and insightful article. I would love to visit bohol sometime. Thanks, Collins. Appreciate the kind words. This is the first time that I’ve heard of Bohol, it looks like a beautiful place. That river cruise is definitely something I’d like to try. The river cruise is definitely worth a try. Thanks for stopping by. First, your baby is so cute and so lucky to get to go on trips already. Second, will you adopt me and take me too? Lol. Lol. How I wish we could take you with us! Thanks, Valerie, for stopping by! you had me at chocolate hills! What a gorgeous location! so exotic! I havent been anywhere for such a long time, your post makes me wanna travel this very moment! Gorgeous pictures! Thanks, Chelf. Appreciate the kind words. The Philippines is so inexpensive! That would make a great trip for someone like me who is always on a budget. I agree. Philippines is one of the best budget destinations! Hope you get to visit it one day. Looks like an interesting place although it’s similar to India topography especially Kerala. I like the idea of river cruise. That boat looks interesting! I can see that! I liked the river cruise to. – perfect way to relax after lunch. This looks like an amazing place to visit! I love the image with the butterfly too! Thank you Ritu!. Always appreciate the kind words .